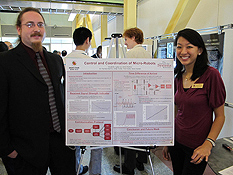 University of Maryland ECE students Lydia Lei and Christopher Perkins won the MERIT-BIEN Best Overall Project Award. The annual fair showcasing undergraduate summer research projects from the Maryland Engineering Research Internship Teams (MERIT) Biosystems Internships for Engineers (BIEN) program and the Training and Research Experiences in Nonlinear Dynamics (TREND) program was held at the Jeong H. Kim Engineering Building on Friday, August 6, 2010. MERIT-BIEN and TREND constitute a unique, 11-week summer research program that offers top undergraduate engineering, mathematics and physics students from around the country the opportunity to engage in cutting-edge, team-based, cross-disciplinary research projects at the University of Maryland. MERIT-BIEN projects range from nanotechnology and microelectronics devices to autonomous control, information security, system modeling, and speech recognition.TREND projects included centrifugal plasma confinement, magnetic reconnection and the dynamics of energetic particles, nonlinear dynamics in charged particle beam systems and optical systems, and the dynamics of soft matter and chaos. The MERIT-BIEN award for Best Overall Project went to Lydia Lei and Christopher Perkins, who are both ECE students at the University of Maryland. Their project, titled "Micro-Robot Control and Coordination," focused on the development of inter-robot communication protocols and an alternative technique for distance sensing (thunder and lightning) among micro-robots with the ultimate goal of achieving coordinated swarm activity. The faculty advisor for this project was Professor Pamela Abshire, and the students were co-advised by Andy Turner, Timir Datta, and David Sander. The MERIT-BIEN award winner for Best Presentation and runner-up for Best Overall Project was Kate Fischl from Princeton University. Her project, titled "Comparison of Histone Protein Locating Algorithms," analyzed changes in gene expression caused by factors outside of the DNA sequence, with the aim of strengthening our understanding of disease and cell malfunctions. Her faculty advisors were Professor Min Wu and Professor Jiuzhou Song of the University of Maryland, with co-advisors Avinash Varna, Wei-Hong Chuang, and Apratim Mitra. The MERIT-BIEN award for Best Written Report went to Aaron Cheng of George Washington University for his project, titled "Optimizing Bacterial Adhesion to a Microfluidic Platform for Monitoring Bacterial Biofilm Growth." His project focused on the formation of bacterial biofilms, composed primarily of bacterial cells and a matrix of extracellular polysaccharides that provide microorganisms advantages such as increased antibiotic resistance. A device was designed for the project to optically monitor the growth of biofilms under microfluidic conditions. The faculty advisor for the project was Director of the Institute of Systems Research and Professor Reza Ghodssi of the University of Maryland, with co-advisors Peter Dykstra and Mariana Meyer. The TREND award for Best Overall Project went to Saara Khan of the University of Maryland for her project, titled "Testing and Analysis of Cesium-based Photocathodes for Free Electron Lasers," which focused on the importance of producing reliable and long lasting photocathodes to meet the future demands of free electron lasers. The faculty advisor for the project was ECE Chairman and Professor Patrick O’Shea of the University of Maryland, with co-advisors Dr. Eric J. Montgomery and Blake Riddick. The TREND runner-up for Best Overall Project went to John Stout of North Carolina State and Matthew Whiteway of the University of Oklahoma for their project, titled "The Effect of Network Structure on the Path to Synchronization in Large Systems of Coupled Oscillators." Systems consisting of a large number of coupled oscillators commonly occur in science, technology, and particularly biology – examples include the synchronization of flashing fireflies, pacemaker cells in the heart, and laser arrays. The Kuramoto Model has been used extensively to model such systems, and the students employed this model to study how different network parameters influence the dynamics of these systems. In particular, they investigated the effects that network size, topology, and the natural frequency distribution of the system have on the path to global synchronization as the overall coupling strength between oscillators is increased. The faculty advisors for the project were Professor Edward Ott, Professor Thomas Antonsen, and Professor Michelle Girvan of the University of Maryland, with co-advisor Gilad Barlev. This year, 12 students participated in the MERIT-BIEN program, while 10 student participated in the TREND program. The MERIT-BIEN program is supported by the National Science Foundation (NSF) while the TREND program is supported by NSF and the Department of Defense (DoD). To view pictures from the fair, please visit http://www.ece.umd.edu/News/images/10_08_Merit_Trend_Fair/.